For all the improvements in computer technology over the years, we still struggle to recreate the low-energy, elegant processing of the human brain. Now, researchers with the Nanostructures for Electrical Energy Storage Energy Frontier Research Center have made an advance that could help computers mimic one piece of the brain’s efficient design – an artificial version of the space over which neurons communicate, called a synapse. "More and more, the kinds of tasks that we expect our computing devices to do require computing that mimics the brain because using traditional computing to perform these tasks is becoming really power hungry," said A. Alec Talin, distinguished member of technical staff at Sandia National Laboratories in Livermore, California; a principal investigator on the NEES project; and senior author of the paper. "We’ve demonstrated a device that’s ideal for running these type of algorithms and that consumes a lot less power." 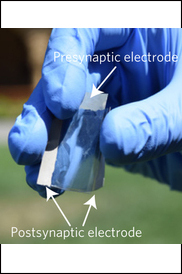 "It works like a real synapse but it’s an organic electronic device that can be engineered," said Alberto Salleo, associate professor of materials science and engineering at Stanford and senior author of the paper. "It’s an entirely new family of devices because this type of architecture has not been shown before. For many key metrics, it also performs better than anything that’s been done before with inorganics." Talin and his gradate student Elliott Fuller are part of the Nanostructures for Electrical Energy Storage project, which aims to create new types of batteries based on nanostructure and nanoarchitecture. NEES is headquartered at the University of Maryland, with Sandia’s Talin as one of the twenty principal investigators on the project. In the same issue of Nature Materials, researchers not related to the project review the work. "ENODe, however, obviates [the voltage time dilemma which states that that low-energy switching and long retention times cannot be achieved simultaneously] with its unique switching mechanism — similar to charging or discharging a battery," say J. Joshua Yang and Qiangfei Xia of the University of Massachusetts. This research was funded by the U.S. Department of Energy, the National Science Foundation, the Keck Faculty Scholar Funds, the Neurofab at Stanford, the Stanford Graduate Fellowship, Sandia’s Laboratory-Directed Research and Development Program, , the Holland Scholarship, the University of Groningen Scholarship for Excellent Students, the Hendrik Muller National Fund, the Schuurman Schimmel-van Outeren Foundation, the Foundation of Renswoude (The Hague and Delft), the Marco Polo Fund, the Instituto Nacional de Ciência e Tecnologia/Instituto Nacional de Eletrônica Orgânica in Brazil, the Fundação de Amparo à Pesquisa do Estado de São Paulo and the Brazilian National Council. We’ve demonstrated a device that’s ideal for running these type of algorithms and that consumes a lot less power.